Tivantinib (ARQ 197) is the first non-ATP-competitive c-Met inhibitor with Ki of 0.355 μM in a cell-free assay, little activity to Ron, and no inhibition to EGFR, InsR, PDGFRα or FGFR1/4. Phase 3. Clin Cancer Res, 2017, 23(15):4364-4375. Tivantinib (ARQ 197) purchased from Selleck. H513 cells were treated with ARQ 197, GDC-0980, NVP-BEZ235 alone and in combination for 48 h. Cell lysates were prepared and immunoblotted for total PARP, cleaved PARP, cyclin D1 and actin as a loading control. PLoS One, 2014, 9(9): e105919. Tivantinib (ARQ 197) purchased from Selleck. The first selective c-Met inhibitor to be advanced into human clinical trials. ARQ-197 has been shown to prevent HGF/c-met induced cellular responses in vitro. ARQ-197 possesses antitumor activity; inhibiting proliferation of A549, DBTRG and NCI-H441 cells with IC50 of 0.38, 0.45, 0.29 μM. Treatment with ARQ-197 results in a decrease in phosphorylation of the MAPK signaling cascade and prevention of invasion and migration. In addition, ectopic expression of c-Met in NCI-H661, a cell line having no endogenous expression of c-Met, causes it to acquire an invasive phenotype that is also suppressed by ARQ-197. Although the addition of increasing concentrations of ARQ-197 does not significantly affect the Km of ATP, exposure of c-Met to 0.5 μM ARQ-197 decreased the Vmax of c-Met by approximately 3-fold. The ability of ARQ-197 to decrease the Vmax without affecting the Km of ATP confirmed that ARQ-197 inhibits c-Met through a non–ATP-competitive mechanism and may therefore account for its high degree of kinase selectivity. ARQ-197 prevents human recombinant c-Met with a calculated inhibitory constant Ki of approximately 355 nM. Although the highest concentration of ATP used is 200 μM, the potency of ARQ-197 against c-Met is not reduced by using concentrations of ATP up to 1 mM. 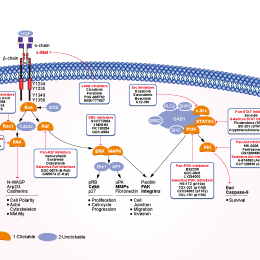 ARQ-197 blocks c-Met phosphorylation and downstream c-Met signaling pathways. ARQ-197 suppresses constitutive and ligand-mediated c-Met autophosphorylation and, by extension, c-Met activity, in turn leading to the inhibition of downstream c-Met effectors. ARQ-197 induction of caspase-dependent apoptosis is increased in c-Met–expressing human cancer cells including HT29, MKN-45, and MDA-MB-231 cells. All three xenograft models treated with ARQ-197 display reductions in tumor growth: 66% in the HT29 model, 45% in the MKN-45 model, and 79% in the MDA-MB-231 model. In these xenograft studies, no significant body weight changes following oral administration of ARQ-197 at 200 mg/kg are observed. Pharmacodynamically, the phosphorylation of c-Met in human colon xenograft tumors (HT29) is strongly inhibited by ARQ-197, as assessed by a dramatic reduction of c-Met autophosphorylation 24 hours after a single oral dose of 200 mg/kg of ARQ-197. This same dosage in mice exhibits that tumor xenografts are exposed to sustained plasma levels of ARQ-197, consistent with the observed pharmacodynamic inhibition of c-Met phosphorylation and inhibition of proliferation of c-Met harboring cancer cell lines. Plasma levels of ARQ-197 10 hours after dosing are determined to be 1.3 μM, more than 3-fold above the biochemical inhibitory constant of ARQ-197 for c-Met. Therefore, ARQ-197 is able to suppress its target in vivo in the xenografted human tumor tissue. In conclusion, ARQ-197 inhibits the growth of c-Met-dependent xenografted human tumors. Recombinant c-Met protein (100 ng) is preincubated with increasing concentrations of ARQ-197 for 30 minutes at room temperature. Following preincubation, 100 μM of poly-Glu-Tyr substrate and various concentrations of ATP containing 5 μCi of [γ-32P]ATP are added to the reaction mixture. The reaction is incubated for 5 minutes at room temperature and then stopped by the addition of 5 μL of SDS-polyacrylamide gel, reducing sample buffer. The samples are then loaded onto a 7.5% acrylamide gel and SDS-PAGE is performed. The phosphorylated poly-Glu-Tyr substrates are ultimately visualized by autoradiography. c-Met activity is quantified by densitometry. Method: HT29, MKN-45, and MDA-MB-231 cells are seeded in black 96-well plates at 5 × 103 cells per well overnight in a medium with 10% FBS. The next day, cells are treated with increasing concentrations of ARQ-197 (0.03-10 μM) for 24, 32, and 48 hours at 37 °C. After ARQ-197 treatment, the drug-containing medium is removed and cells are incubated for at least 10 minutes in a labeling solution (10 mM HEPES, 140 mM NaCl, and 6 mM CaCl2) containing 2 μg/mL Hoescht 33342 (blue channel), 500-times diluted Annexin V-FITC (green channel), and 1 μg/mL propidium iodide (red channel). High-content image acquisition and analysis are carried out. The program is set to take four images per well. The exposure time is set at 16.7 ms/10% gain, 500 ms/35% gain, and 300 ms/30% gain for the 4,6-diamidino-2-phenylindole, FITC, and rhodamine channels, respectively. Images are processed and the numbers of positive cells for each channel and each condition are determined. In addition, HT29 cells are treated with increasing concentrations of ARQ-197 for 32 hours in the absence or the presence of 25, 50, and 100 μM ZvAD-FMK (irreversible general caspase inhibitor), and the same procedures are undertaken. All experiments are done in triplicate. To determine whether the apoptotic effect is due to c-Met inhibition, the effect of ARQ-197 when glyceraldehyde-3-phosphate dehydrogenase (GAPDH) and c-Met are knocked down using siRNA is investigated. HT29, MKN-45, and MDA-MB-231 cells are transfected with a nontargeted control siRNA, a gapgh-targeted control siRNA, or a met-targeted siRNA. After 3 days, c-Met, GAPDH, and β-actin expression levels are determined using specific antibodies. To determine if the effect is caspase dependent, HT29, MKN-45, and MDA-MB-231 cells are transfected with a met-targeted siRNA for 2 days and incubated in the absence or the presence of increasing concentrations of ZvAD-FMK for 1 additional day. A nontargeted siRNA and a gapgh-targeted siRNA (siRNA GAPDH) are also transfected in parallel, as controls. Cells are then stained with Annexin V-FITC and propidium iodide, and the percentage of apoptotic cells is determined. Munshi N, et al. Mol Cancer Ther. 2010, 9(6), 1544-1553. Comoglio PM, et al. Nat Rev Drug Discov, 2008, 7(6), 504-516. Are there any other solutions (apart from DMSO) I can dissolve S2753 for in vivo experiment? S2753 Tivantinib (ARQ 197) can be dissolved in 1% methylcellulose at15 mg/ml as a suspension. BMS-777607 : C-Met, IC50=3.9 nM；Axl, IC50=1.1 nM; Ron, IC50=1.8 nM; Tyro3, IC50=4.3 nM. INCB28060 : C-Met, IC50=0.13 nM. Crizotinib (PF-02341066) : Approved by FDA for non-small cell lung carcinoma (NSCLC). EMD 1214063 New : Potent and selective c-Met inhibitor with IC50 of 4 nM, >200-fold selective for c-Met than IRAK4, TrkA, Axl, IRAK1, and Mer. Erlotinib is an EGFR inhibitor with IC50 of 2 nM, >1000-fold more sensitive for EGFR than human c-Src or v-Abl. R428 (BGB324) is an inhibitor of Axl with IC50 of 14 nM, >100-fold selective for Axl versus Abl. Selectivty for Axl is also greater than Mer and Tyro3 (50-to-100- fold more selective) and InsR, EGFR, HER2, and PDGFRβ (100- fold more selective). Crizotinib (PF-02341066) is a potent inhibitor of c-Met and ALK with IC50 of 11 nM and 24 nM in cell-based assays, respectively. Foretinib (GSK1363089) is an ATP-competitive inhibitor of HGFR and VEGFR, mostly for Met and KDR with IC50 of 0.4 nM and 0.9 nM in cell-free assays. Less potent against Ron, Flt-1/3/4, Kit, PDGFRα/β and Tie-2, and little activity to FGFR1 and EGFR. Phase 2. 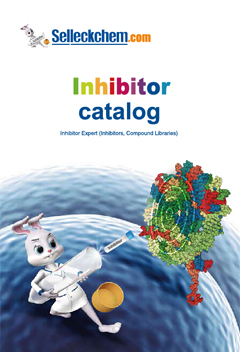 Capmatinib (INCB28060) is a novel, ATP-competitive inhibitor of c-MET with IC50 of 0.13 nM in a cell-free assay, inactive against RONβ, as well as EGFR and HER-3. Phase 1. Features:Inactive against RONβ, another member of the c-MET RTK family, as well as EGFR and HER-3 (members of the EGFR RTK family). PHA-665752 is a potent, selective and ATP-competitive c-Met inhibitor with IC50 of 9 nM in cell-free assays, >50-fold selectivity for c-Met than RTKs or STKs. BMS-777607 is a Met-related inhibitor for c-Met, Axl, Ron and Tyro3 with IC50 of 3.9 nM, 1.1 nM, 1.8 nM and 4.3 nM in cell-free assays, 40-fold more selective for Met-related targets versus Lck, VEGFR-2, and TrkA/B, and more than 500-fold greater selectivity versus all other receptor and non receptor kinases. Phase 1/2. Features:A potent inhibitor of the Met family, and >40-fold selectivity vs. Lck, VEGFR2, and TrkA/B and >500-fold selective vs. other receptor and non-receptor kinases. PF-04217903 is a selective ATP-competitive c-Met inhibitor with IC50 of 4.8 nM in A549 cell line, susceptible to oncogenic mutations (no activity to Y1230C mutant). Phase 1. SU11274 is a selective Met inhibitor with IC50 of 10 nM in cell-free assays, no effects on PGDFRβ, EGFR or Tie2.